Culms: Erect, solitary or in small clusters, hollow, waxy, glabrous. Blades: Flat or rolled inward, 4 to 10 inches long, to 1/4 inch wide, rigid, bluish green waxy, rough above, prominently veined; tips tapered to sharp points. Sheaths: Shorter than internodes, open, glabrous or rough; auricles conspicuous. Ligules: Short, membranous, notched or minutely fringed. 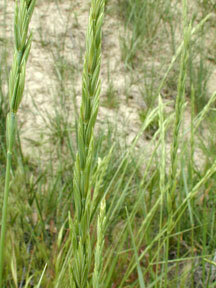 Inflorescences: Spikes, erect, 2-sided, 3 to 8 inches long. Spikelets: Solitary or sometimes 2 per node, flattened, waxy, 1/2 to 1 inch long, overlapping, 3-12-flowered; glumes unequal; glume and lemma tips pointed, occasionally awned. Habitat: Moist to dry prairies, waste areas, ditch banks and roadsides, most abundant in fine-textured alkaline soils. Forage Value: Western wheatgrass is nutritious for livestock and is readily grazed during the early growth stage. It makes good quality, high-protein hay when cut during the late-bloom stage.